By now, the fact that many women's products are more expensive than the men's counterparts is hardly shocking. It's been well documented that there is a "pink tax" on everything from women's toiletries to girls' toys simply because they have pink butterfly designs on them. Here are four gendered products that you might consider buying, no matter what color they come in. It may seem as if the only difference between a razor marketed to men and one marketed to women is the color of the packaging. But there are some important, if subtle, differences in these products. To start, it's important to note that the razor blades themselves are identical in men's and women's razors. There is no difference whatsoever between the "blade technology" used in the two types of products. The differences between these razors lie in the handle of each razor, and the positioning of the blades. In men's razors, the blades are often set at a more oblique angle with a different handle contour, which makes it easier for a shaver to see what he is doing while shaving his face in front of a mirror. The angle and handle contour on women's razors are made to be easier to use when looking down at your legs while shaving. The angle of the blades helps explain why some consumers claim that men's razors provide a closer shave. The more oblique angle does offer a somewhat closer shave, but at the risk of nicks and cuts. Since men's facial hair tends to be thicker than women's leg hair, this trade-off is often worth it for men. Finally, a woman's legs are 18 times the surface area of a man's face, which explains one more big difference between the two types of razors. Women's razors are more likely to have a larger head, including a "guide bar" which helps to position the hairs properly, and often includes some sort of moisturizing strip. These designs help to prevent cuts when you are shaving quickly, and make it easier to shave longer hair. Since women often go some time between shaves — unlike men who will often shave daily or several times a week — this helps make her shave smoother than what she would get with a men's razor. 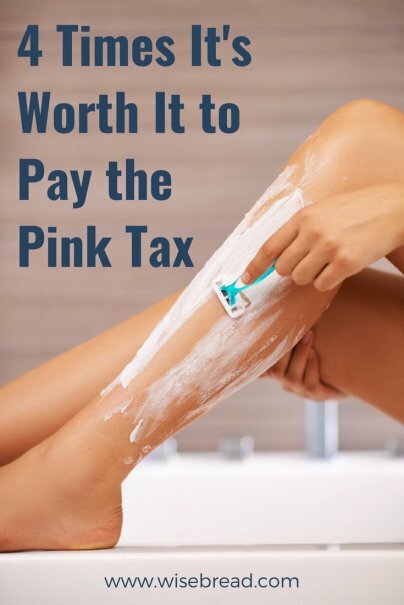 If women are willing to spend the extra money, women's razors can help them get a quicker and more convenient shave with fewer nicks and cuts. If women would prefer to spend a little less money and are willing to take a little more time with shaving, men's razors will work perfectly well. And for men with extremely sensitive skin, a woman's razor might be a little more work to use because of the angle and handle contour, but it may be worth it to cut down on nicks and razor burn. As for the shaving cream you use to get a nice smooth shave — there is absolutely no difference between men's and women's products, other than scent and price. So feel free to buy whatever's cheapest or smells the best. Though everything from shampoo and conditioner to hair spray is marketed according to gender, the biggest concern when it comes to your hair care should be the texture of your hair and your hair cut. Women's hair care products often have additional ingredients geared toward mitigating or accentuating texture issues — such as frizz control or curl enhancer. You are also more likely to find color care products among women's hair care lines, which help to protect dyed hair. Men's hair care products, on the other hand, generally focus on nothing more than dandruff or oily hair problems. Since men often keep their hair short, the texture of their hair does not matter as much. There are fewer hair care choices for men, and they tend to have different scents and cost a little less than women's products. Women's hair care products are not substantially different from men's products, other than the fact that it is easier to find a product for women that specifically addresses whatever hair care need you may have. Men with long hair or dyed hair may find that women's hair care products work better for them. Men and women have biological differences in their skin. To start, men's skin is 25 percent thicker than women's skin. In addition, the sebaceous glands, which secrete sebum (the oily substance that leads to the dreaded "shine") are more active in men than in women, meaning men have oilier skin than women. Finally, men's skin has a higher density of collagen and elastin proteins than women's skin. Those proteins help keep skin smooth and supple. These differences mean that men's skin care products can use somewhat harsher detergents, because the result will be less drying of men's skin than it would be for women's skin. The differences in men's and women's skin also helps to explain the existence of all-in-one shampoo-and-soap combinations that are marketed to men. These products work pretty well for men because of their oilier skin, and marketers are able to sell the idea of a single, no-nonsense product. As with hair care products, the biggest consideration when you are buying a skin care product should be your unique skin needs. If you are a woman with oily skin, a soap or moisturizer that is made for oily skin will probably work for you, whether the packaging is pink or blue. Similarly, someone with dry skin or sensitive skin should find products that meet that need, rather than focus solely on whether the product is specifically marketed to men or women. However, because there are real differences between men's skin and women's skin, many women may find that general skin care products that are produced and marketed for women do a better job of protecting their skin. It's also important to note that men's products are more likely to be unscented, even though women's skin tends to be more sensitive to the kind of irritation that fragrance causes. Roam the aisles of your local pharmacy, and you'll find gendered versions of vitamins, painkillers, and other over-the-counter medication. Some of these products are genuinely different, while others are exactly the same in different-colored boxes. While vitamin formulations tend to be basically the same between men and women, the National Institutes of Health recommends that premenopausal women take more than twice as much iron as men, because menstruation increases the need for iron. While taking a vitamin not formulated for you will not seriously harm you, the effects do add up — and taking too much iron, for instance, can leave potentially dangerous deposits in your organs. That being said, the majority of young and healthy people who are getting adequate nutrition probably do not need to take a daily vitamin at all, unless they are dealing with a specific deficiency. As for the other types of medications that are offered in gendered versions, there can often be a good reason for women to choose the women's formulation over the general formula or men's formula. For instance, women's painkillers are often formulated to specifically help with the cramps and bloating associated with menstruation, which can help provide better relief than a general painkiller. However, some gendered over-the-counter medications are simply a difference in marketing. For instance, laxatives that are geared toward women have the exact same active ingredients as the general version. While women's laxatives are marketed as being gentler on the stomach, they are no different from the gentle formula offered in the other box — only the inactive ingredients (i.e., the things that account for the bulk and color of the medication) differ. When it comes to over-the-counter medications, all consumers need to read the active ingredients to know what they are getting. In some cases, the active ingredients are different between products marketed to men and those marketed to women. That's when it makes sense to buy the product that is made for you. But when the active ingredients are the same, it doesn't matter which one you choose.